Pleyel's birthplace Ignaz Pleyel was a highly talented composer of the second half of the 18th Century and beginning 19th Century. Around the year 1800 Pleyel belonged to the most popular and most often performed composers of Europe. 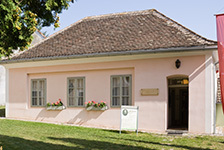 Ignaz Joseph Pleyel was born on 18 June 1757 in Ruppersthal, Lower Austria, as the son of the village schoolmaster Martin Pleyl and his wife Anna Theresia. 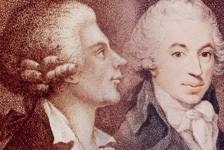 The support of a patron enabled him to be trained, first by Johann Baptist Wanhal, and then more thoroughly by Franz Joseph Haydn, before he became Court Conductor for his patron, Count Ladislaus Erdödy in Pressburg (present-day Bratislava), who made it possible for him to journey to Italy. Ignaz Joseph Pleyel In 1783 Pleyel became Assistant Conductor, and in 1789 Cathedral Conductor of the Strasburg Minster. In 1788, having gained immense popularity as a composer, he married Françoise Gabrielle Lefebvre. In 1791 he accepted an invitation to conduct the "Professional Concerts" in London. Arrested by the revolutionary authorities, he saved himself by writing a very effective revolutionary cantata to honour the French Revolution. In 1795 he moved with his family to Paris, founded a music publishing house and in 1807 a piano manufactory. His instruments were world-renowned. Pleyel's oldest son Camille took over the businesses and together with his father founded the "Salle Pleyel", well-known even to this day. Pleyel found his final resting place in a grave of honour in the celebrity Père-Lachaise cemetery in Paris.